Farmlab + George Herms Team Up For "Opera Workshop"
George Herms is a Los Angeles-based artist. Working inside the otherwise vacated "Phantom Gallery" space at 269 N. Beverly Drive, in Beverly Hills, Calif, members of the Farmlab team have set about creating, "AMAZE." This experimental labyrinth is a zone of play, flexibility, and collaboration located in the heart of a renowned commerce district where passers-by are offered constant opportunities to consume, but far fewer to build and make. Utilizing a palette of salvaged materials (steel rods, telephone wire, kimonos, etc. ), and inspired by the assemblage work and recycling ethos of George Herms – himself a recent Farmlab artist-in-residence – Farmlab team members have since mid-July been working to transform the large, ground-floor lobby area of this former bank building. AMAZE aims to explore the idea of collaborative endeavors as the result of individual acts. Rather than decide every move together, Herms and Farmlab build separately, in different sections of the venue. The end result is a loose framework that likely – or not – will fit together. Members of the public are invited to join in and add to the maze as they see fit, either by bringing in their own materials or using items already on-hand. George Herms’ Jazz Opera Workshop, set in the eye of the maze, mingles with the rollicking larger construction and is best viewed from a cocoon-like seating arrangement built within the maze's framework. Public workshops of two of the acts of this five-act opera, with accompaniment from leading jazz musicians, will take place on August 18 & August 25. Act One, Scene One: A Sculptor's Studio; Act Two: Away; Act Three: Oops: Act Four; Evil (The taking down of the Serapeum); and Act Five: The Redemption Kiss. On this evening, Herms and musicians will workshop, "Act Two: Away." Jazz musicians joining Herms on 8/25 are: Roberto Miranda (bass), Bobbie Bradford (cornet), Vinnie Golia (reeds), Clayton Cameron (drums), Miguel Atwood-Ferguson (viola). On this evening, Herms and musicians will workshop, "Act One, Scene One: A Sculptor's Studio," a salute to john Coltrane. A spiral staircase will be elevated, and a large spherical buoy played. Jazz musicians joining Herms on 8/25 are: Theo Saunders (piano), Adar Lawrence (tenor sax); Henry "The Skipper" Franklin (bass); Ramon Banda (drums); David Dalston (trombone). Levitation of the spiral staircase is courtesy of Bill Gray. Farmlab's short-term multi-disciplinary investigations of land use issues related to sustainability, livability, and health are conducted by members of the team behind the recent Not A Cornfield project in Downtown Los Angeles. NAC project artist Lauren Bon is Farmlab's founder and Creative Director. Phantom Galleries LA is a Los Angeles County-based organization that transforms unoccupied storefronts and spaces into temporary art galleries. Exhibits are curated by local arts organizations, Los Angeles-based galleries, independent curators, and Los Angeles-based artists. The project gives artists an opportunity to exhibit their work, while promoting the creative community to a broader audience and keeping the area looking vital and culturally exciting. The spaces are lit and on view 24 hours a day. Phantom Galleries offers a special thank you to the City of Beverly Hills Economic Development Office for their continued support and assistance in launching the Beverly Hills Phantom Galleries LA program. "In Beverly Hills we believe that a vital economy needs an active art and cultural core." – Alison Maxwell, Director of Economic Development and Marketing for the City. A crowd of 300 or so people gathered Under Spring Saturday night, July 28, 2007 for The Camel's Back, part of Farmlab's "Accidentally on Purpose" series that celebrates summer and spontaneity. Folks who came were treated to the likes of a collaborative performances by guitar hero Nels Cline, bassist Jesske Hume, and butoh dancer extraordinaire, Oguri; and, as if that wasn't spectacular enough, the premiere of composer Yuval Ron's work, "Maya." 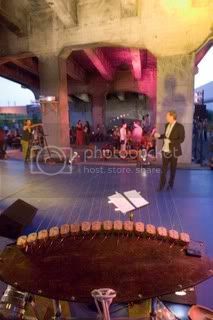 That piece featuring both wind instrumentation and the playing of an enormous "earth harp" -- a massive string instrument made of thick wires that stretched nearly the complete length of Under Spring. More music followed by Arnie Saiki's band, Obakesan, featuring dance by Robert Scott; and a solo dance piece by Miles Tokunow. The Farmlab Team continues to negotiate for permissions required to begin a local public pilot project involving mycoremediation techniques. In the meanwhile, muchroom growing continues at the Farmlab warehouse. "Farmlab's last round of mushroom growing began June 18, 2007. We inoculated about 50 bags of corn straw with fresh oyster mushroom spawn, spen[t] mushroom bags and inoculated burlap sacks. Not all the bags have been fully colonized, with many succumbing to green mold, but the bunker spawn in burlap sacks is doing well. We are still learning the way of the fungi. We have set up a space that will function as a mushroom laboratory, complete with a laminar flow hood donated to us by the San Fransisco Exploratorium." Join Robert Gottlieb (and likely some other folks from the Urban and Environmental Policy Institute) for this Farmlab Public Salon. Los Angeles -- perceived to be the place without a sense of place -- might seem inhospitable to efforts to connect with nature and community. This Salon -- Reinventing L.A.: Nature and Community in the Global City -- drawing on the recently published book with that same name, will describe how a handful of imaginative and innovative social movements have coalescaed around issues of water, cars and freeways, land use, immigrants, and globalization, to seek to create a more livable and just region. Robert Gottlieb is the Director of the Urban & Environmental Policy Institute (UEPI) and Professor of Urban and Environmental Policy at Occidental College. He is the author or co-author of eleven books, including Forcing the Spring: The Transformation of the American Environmental Movement; Environmentalism Unbound: Exploring New Pathways for Change, and The Next Los Angeles: The Struggle for a Livable City. He is currently working on a new book on the topic of Food Justice, with his colleagues at the Center for Food & Justice, which is a division of UEPI. Image of ArroyoFest courtesy Robert Gottlieb, from the cover of his forthcoming book. "Avant-Garde Environmentalism: From Bioneers to Burning Man to Bunnies that Glow Green." 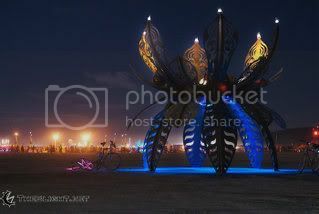 Among the art at Burning Man 2007 was a machine that turned carbon into algae food and algae into fuel, a creature that turned garbage into hydrogen and a 90-foot effigy of an oil derrick surrounded by metal supplicants. And on the movie screens this summer was a Leonardo DiCaprio documentary featuring pollution-fighting mycologists, radical zero-waste architects and advocates of sustainable consumption. Does all of this herald a new communion among art, popular culture and fringe technology for the sake of the planet? And how can we continue to harness progressive art to halt the squandering of our resources and the toxifying of our planet? Judith Lewis is a staff writer for the LA Weekly. She blogs at Another Green World. Simone White, singer-songwriter. Her new record "Jam the Man" is currently being featured on "Sounds Eclectic" and other radio shows around the country, *and* she's got on a song on it about sustainable farming. Laurie Kaufman,organizer, activist and writer. Kaufman is a former Bioneers staffer and has worked in the environmental and social justice fields for more than 10 years in areas including urban forestry, organic farming, community self-reliance, youth-at-risk and children of incarcerated parents. Laurie has written for the Journal of the Society of Municipal Arborists, the Daily Breeze, Southern Sierran, Santa Monica Mirror and Resurgence magazine. She recently produce a short video about the Griffith Park fires and worked on the award-winning video "Hawaii in Transition: Vision for A Sustainable Future" (Sheila Laffey, Director). Jason Keehn, aka Cinnamon Twist, of The Learning Party, is also on the bill. And, David Newsom, who organized an event on Bill McKibben's "StepItUp '07" day last spring, will be on hand as well. Join Farmlab for this special presentation of actor/writer and environmentalist Kristina Haddad's 45-minute-long, one-woman play titled, "Save Sheldon." The performance is part of the weekly Farmlab Public Salon series, held every Friday @ noon. ancient tree, Sheldon, from the hands of the fictional Hawley Development Company. In this solo show Haddad encounters roadblocks, friends, foes, and drops of inspiration in order to save Sheldon from his demise. shows the lengths one activist will go to a beloved tree named Sheldon. Save Sheldon has been performed throughout the western United States both as a benefit and to general audiences. Save Sheldon has been performed as a benefit for the Klamath-Siskiyou Wildlands Center, Ebbetts Pass ForestWatch, and the Sequoia ForestKeeper. Kristina Haddadis an accomplished writer and performer who is passionately dedicated to performance and the art of storytelling. She has appeared in dozens of plays around the Los Angeles area including the acclaimed satire, "OJ Law", which garnered significant media attention, as well as the political satires, "Media Whores", "Scary Monsters" and "Traditional American Values." She has also performed in "Hatful of Rain", "The Maids", "Museum" and other more well known plays. In 2004 Kristina won 2nd place at Theater CRAM a 48 hour theater festival that was judged by top industry professionals including film director Roland Joffe and former studio head David Kirkpatrick. She has performed her one person environmentally themed show “Save Sheldon! !” throughout the Western United States. Most recently she performed in J.D. Lewis' politically charged critically acclaimed play "AmerWrecka" which had its debut at the 2005 Edinburgh Fringe Festival and has had subsequent runs in Los Angeles and at the 2006 Unfringed Festival in Limerick, Ireland. Haddad co-wrote, produced and performed in the poetry performance piece "Unveiling the Gypsy Soul" and had her first play, "The Honey Pot" produced at the Santa Monica Playhouse. She co-starred in the critically acclaimed independent film "Staccato Purr of the Exhaust" (Sundance Film Festival, Winner Florida Film Festival Grand Jury Prize) and has also appeared in several other independent films including "Without a Map" (AFI Film Festival), "Pool" (USC First Look Festival), "The Groom" and "Moving Alan". She was one of the founders of the Re-Assembled Parts Theatre Company and is a past member of the Ark Theatre Company. Haddad will be appearing in the Adam Sandler movie, "You Don't Mess with the Zohan." Attention to the obesity epidemic in the United States often focuses on individual eating behavior. However, it's not easy to find healthy and affordable foods in every neighborhood, including areas of Los Angeles. Project CAFE (Community Action on Food Environments) is a collaborative, community-based project that has mapped food access in 3 neighborhoods in Central and South Los Angeles. Partners at the Center for Food & Justice, Blazer Learning Center, Esperanza Community Housing Corporation, the Healthy School Food Coalition, USC, and Childrens' Hospital Los Angeles are working together to identify these issues and implement solutions. In the 3 areas where we worked, we found that about 30% of all food establishments are fast food/to-go restaurants, about 22% are convenience/liquor/corner stores, and less than 2% are supermarkets. These convenience/liquor/corner stores are missing many foods needed for a healthy diet and generally have higher prices than supermarkets. In this salon, we’ll share the process and results of this food assessment and discuss ways to engage residents, policymakers, and business owners in creating neighborhoods where everyone can access healthy, affordable foods. director she helps to plan and implement research and evaluation of various projects under UEPI's umbrella and serves on the institute's "core staff." Andrea has a bachelor's degree from Occidental College and a master's degree from Cornell University. Elizabeth Medrano's active community involvement began in 1997, a few years after migrating from central México. Since, she has worked with low-income immigrants and other communities of color to address issues such as public transportation, the environment and the lack of health care through education and organizing efforts. As an organizer for the Center for Food and Justice, Elizabeth works with parents and other community allies to improve access to quality meals through the implementation of the recently approved Cafeteria Improvement Motion within the Los Angeles Unified School District. Elizabeth is the mother of a 7-year-old boy. "The Cornfield: New Ideas for a Sustainable Urban Park"
Since completing the Not A Cornfield project, the Farmlab team has given considerable thought to the rich and varied potential of sustainable urban parks. One such model that we find especially insightful is described in "New Ideas," which was written by Michael Woo and published by Farmlab. The report provides a conceptual plan for a 31.5-acre park and working farm that combines a demonstration garden, a resource center, educational programs, a café, a conference center, and a gift shop, all with a mandate that the plan achieve both ecological and economic viability. Farmlab believes considerable creativity and vision can be brought to bear on the use of public space. New Ideas Report is "Do-able Alternative"
Archinect.com was among the news media outlets with a representative in attendance during the Friday, July 13 introduction of the Farmlab-produced report, "The Cornfield: New Ideas for a Sustainable Urban Park." Orhan Ayyuce, a senior editor of the site, writes that, "The plan for a 31.5-acre park provides a do-able alternative to high budget proposal that a recent competition produced." Click here for the full Archinect post, which includes ten photos taken at Farmlab and Under Spring. Join artist Lucas Reiner as he discusses his on-going fascination with trimmed trees -- and the photographs, paintings, drawings, and film that have resulted from this. Of particular interest to regular Farmlab Public Salon attendees might be On Alameda Ave. #1 (SCF). Reproduced above, this 2007 oil on canvas painting by Reiner was commissioned by Farmlab, and features as its subject matter the venerable, intertwined California Black Walnut trees that were the iconic symbol for the former South Central Farm. Lucas Reiner is an artist who lives and works in Los Angeles. 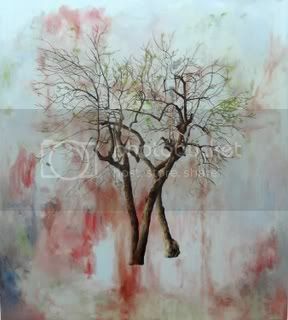 Since the Fall of 2001 he has been painting urban trees, trimmed by the Department of Transportation. He has exhibited his paintings, drawings, and videos in galleries in Los Angeles, Houston, New York, London, Munich, Milan, Mexico City, La Paz, and Buenos Aires. Art in America described his paintings as "resonating with emotion, poetry and gritty reportage". In 2004 he received a Lester Horton award for scenic design for Helios Dance Company. He is currently exhibiting work at "Pocket Utopia", an exhibition/salon/social space run by Austin Thomas in Brooklyn. For more information, please click the various links located on this page. "The incredible thing to report is that the agbins are being taken care of by the community, with open arms. The gardens, in general, are green and thriving. 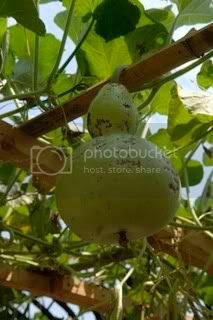 "However, one of the individuals from the Lamp Village organization has volunteered to water and maintain those two agbins. 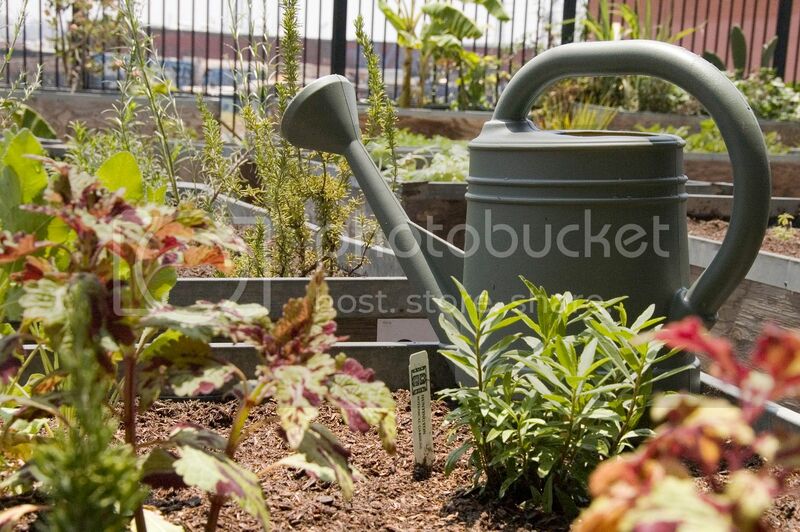 This means he will be carrying buckets of water to make sure the plants have a fighting chance of surviving. The Master Gardeners-in-training also are pairing up with the organizations to assist in maintaining the agbins throughout the growing season. 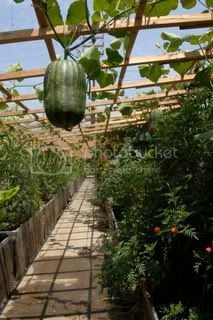 "At the Lamp Lodge site, the agbins were lusciously green and overflowing with foliage. One gentleman, whom we'll call "Elvis," has been watering, and nurturing the four agbins -- and it shows. He told us that the word has been passed around the downtown grapevine that these agbins are for everyone. 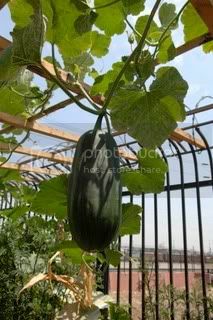 "Some people have even brought packages of seeds of their favorite vegetable or flower that they wish to see grow. We heard stories that Row residents, same as Farmlab team members, are curious to see the future development of the agbins, as the plants begin to produce red tomatoes, cucumbers, cilantro, chili peppers, corn, daisies, mint leaves and –- can’t you just smell that pungent aroma? -- fresh basil. "The agbins, we hope, have brought a least some small measure of beauty to the neighborhood’s often bleak surroundings. These small wonders, these silent gifts of nature, are perhaps bringing slight new hopes in very private moments to an underserved community." 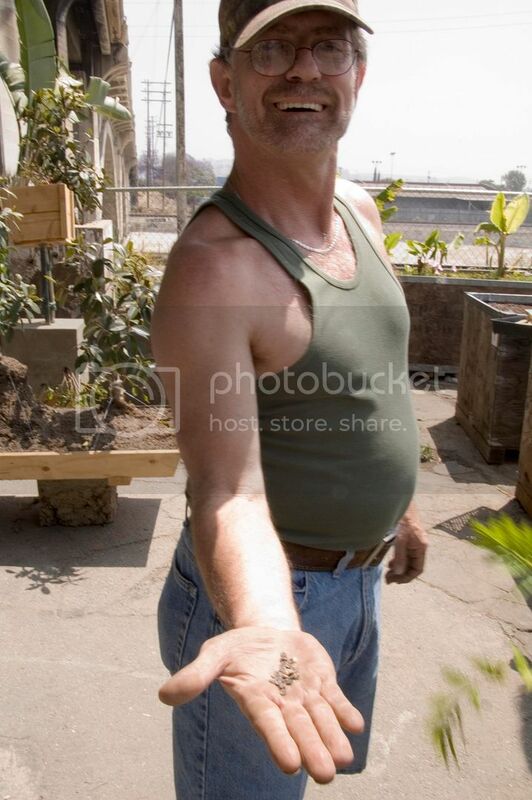 Above: "Elvis," the caretaker of the agbins at LAMP Lodge, shows off recent vegetable growth; and, since their delivery three weeks ago, the agbins by H2CLA have been colorfully painted. "Commitment Issues and Cross-Disciplinary Entanglements"
This week's Farmlab Public Salon asks: Do you have chemistry? Are you compatible? What does it mean to step outside your comfort zone? What does it take to make meaningful, long-term relationships thrive? And how do multiple partners figure in their success? Relationships between artists and community-based organizations are complex organisms. For the past nine months, Public Matters has been working in partnership with HEAC to develop and integrate place-based youth media projects with the group’s health policy and community initiatives, positioning the youth as active community health leaders. Public Matters has worked with a group of high school students at The Accelerated School (TAS) to assess health disparities and create short videos about the reasons underlying poor access to fresh produce and nutritious foods in South L.A. These videos are closely integrated with broader policy and community actions. For instance, given the scarcity of supermarkets and groceries in the area, students are leading the effort to convert and “green” a South L.A. corner store to carry healthier food choices. This “market makeover” will serve as a model for other neighborhood stores and will help HEAC establish a partnership of corner stores that will increase their collective buying power for healthy produce. The student videos will also be featured and set the tone for a broader community forum on public health issues in South L.A. co-produced with the office of Councilwoman Jan Perry in District 9 this fall. These actions ensure that Public Matter’s work doesn’t end with a well-meaning youth media project that few will ever see, but in fact extends and realizes HEAC’s civic goals and gives the HEAC youth a prominent leadership role in the community. These issues—creating cross-disciplinary projects with depth and the link between creative acts, civic engagement and policy initiatives—are key to not only both Public Matter’s and HEAC’s work, but also to realizing effective civic impact. At the heart of this Salon are the questions of sustainable projects, length of commitment and depth of integration. What are the impact of short and long-term projects and interventions? How can these be understood from the artists’, practitioners’ and community’s point of view? Public Matters is a recently formed group of artists, educators and media professionals who integrate civic engagement with interdisciplinary neighborhood-based art, media and educational projects. It aims to train community leaders who are creative, media savvy problem solvers and critical thinkers who have a deep understanding of their neighborhoods. Public Matters generates innovative, artistic, place-based projects that build creative, civic and social capital in communities. Public Matters’ goals are to build social capital, bring forward unknown aspects of community life, and give future leaders a diverse and effective set of skills to work on behalf of their communities. The South L.A. Healthy Eating Active Communities (HEAC) Initiative is a diabetes and obesity prevention initiative including health, education, advocacy, civic and media/advertising entities supported by The California Endowment. Creating healthy eating and physical activity environments in low-income and resource-poor communities requires the adoption of policies, practices and norms that make healthy foods and physical activity opportunities available and appealing. HEAC aims to demonstrate how collaborative approaches can change environmental risk factors. Mike Blockstein is a visual artist, educator and the Principal of Public Matters. He works in community-based art that explores the intersection of cultural narratives, artistic process and civic engagement. He has created and led place-based interdisciplinary projects nationally, working with youth, community leaders and organizations to reflect on, understand and shape their physical, social and political geographies. Projects include A Chinatown Banquet, a collaborative multi-disciplinary project about Boston Chinatown and Custom Mobile Commerce, an exploration of street vending in Los Angeles. Committed to civically-based art, Mike also holds a Masters of Public Administration from Harvard's Kennedy School of Government. Reanne Estrada is an internationally exhibiting visual artist whose diverse practice includes installation, performance, video and public art. She worked for nine years as an educator and in cause-related marketing, design, and curatorial programming at Creative Growth Art Center, an internationally recognized studio and gallery for artists with disabilities. Currently working on a project in Historic Filipinotown, her public art projects emphasize a collaborative approach and focus on community narratives in Asian American communities. Reanne has an A.B. in Visual and Environmental Studies from Harvard University. As Project Coordinator for South L.A. HEAC, Aurora Flores plays a lead role in engaging policy makers, collaborative partners, community residents and youth leaders to promote safe, healthy environments. Ms. Flores has more than 10 years of experience as a public health practitioner. Her areas of expertise encompass health promotion and disease prevention, program planning and implementation, and training and technical assistance in HIV/AIDS, tobacco policy, and cancer control. Ms. Flores holds a B.S. in Health Science with an emphasis in Community Health from California State University, Long Beach and received her Master in Public Health from the University of Southern California. Join Cara Baldwin for "a belligerent celebration of the ways artists and activists endlessly consume and reclaim ourselves, one another and our environment." Hot punk transcendentalists, ecstatic environmentalists and sticky precisionists will talk and take a walk about cultural constructions of / responses to notions of waste, excess, surplus, transformation and reclamation, particularly in western post-industrial society. Recently, members of the Farmlab team joined colleagues from the Annenberg Foundation on a fact-finding trip to the Owens Lake and Mono Lake region of California's Eastern Sierras. The group was shown around in part by the good folks at the Mono Lake Committee. Various tour stops included a fledgling fish hatchery, the Dr. Suessian, limestone tufa, and a geothermal operation. Among other related topics, the trip was an extended watershed study. The area's H2O, of course, had long-since -- and controversially -- been depleted by the city of Los Angeles. The epic story, known by most Angelinos and certainly by Sierra residents, involves legendary Zanjera William Mulholland, spectacular feats of engineering, land speculation, anger, lawsuits, and other 20th century recriminations. Last December, as this recent newspaper story recounts, Los Angeles began diverting -- or re-diverting, perhaps? -- some water to the Lower Owens River. Please check back to this Farmlab.org blog in the coming weeks for more text, as well as for photos and audio, from the visit. At the top of the page, the famous tufa of Mono Lake; also, visible in the lower right-hand corner of the shot, the flies that line the lake's shorline. Immediately above, a dry patch of the lakebed. The End of SoCal Lawns? Record-Low Rainfall? Okay, well maybe not "first." 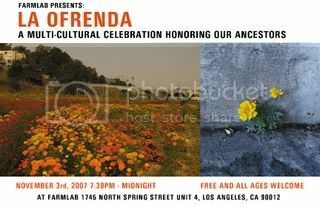 But for anyone who is both a regular attendee of free-of-charge Friday @ noon Farmlab Public Salon (complete schedule), as well as a reader of the Los Angeles Times, then at least a pair of stories in the Thursday, July 5, 2007 edition would be old news. First, there's a huge piece on the cover of the weekly Home section, headlined, "Public enemy No.1?" Teaser text preceding the headline says, "Lush lawns are a Southern California obsession. But with rainfall at historic lows, a turf war is heating up. Critics wonder if grass is always greener." That story brings to mind the comments and work of -- among others -- Fritz Haeg, he of GardenLab and the Edible Estates projects. 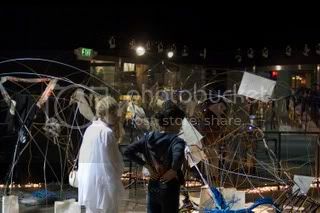 Here's a brief write-up of Haeg's December, 2006 Farmlab Public Salon appearance. Also, in today's California section was a chart detailing the "Driest L.A. rain season on record." As in, the past year, only 3.21 inches of rain was registered in downtown. That's about a foot less than average -- though as Farmlab Public Salon attendees will recall, when JPL climatologist extraordinaire Dr. Bill Patzert stopped by in late March to deliver his always candid and colorful remarks, Patzert reminded the crowd not to take that statistical norm too much to heart -- in short, don't expect that amount of precipitate. L.A.'s rainfall has traditionally been more boom and bust. Of course, without the local wherewithal to capture and capacity to store runoff from those occasional winter water deluges, then at least from this blogger's understanding, those 'booms' are more like the sound of one-hand-clapping. Farmlab and Under Spring will play host in the coming months to "Accidentally on Purpose," a series of four free-of-charge evenings celebrating summertime and spontaneity, and featuring live music, movement, dance, puppetry, film, and more to be announced. Each of the programs will take place at Under Spring, the performance venue located adjacent to Farmlab. The series will be divided into two parts. An evening of music and dance organized by Roxanne Steinberg. On the bill: Jesske Hume with Nels Cline (music, percussion) and Oguri (dance); Robert Scott and Arnie Saiki (music); Miles Tokunow (dance); and a world premiere by Yuval Ron (music, earth harp composition). Organized by Dublab, this all-night event of ambient music featuring numerous musical, artistic, and other collaborators. More information to be announced soon. This film screening is organized by the Echo Park Film Center, and also features other local icons, Fallen Fruit, Scoops, and more to be announced soon. 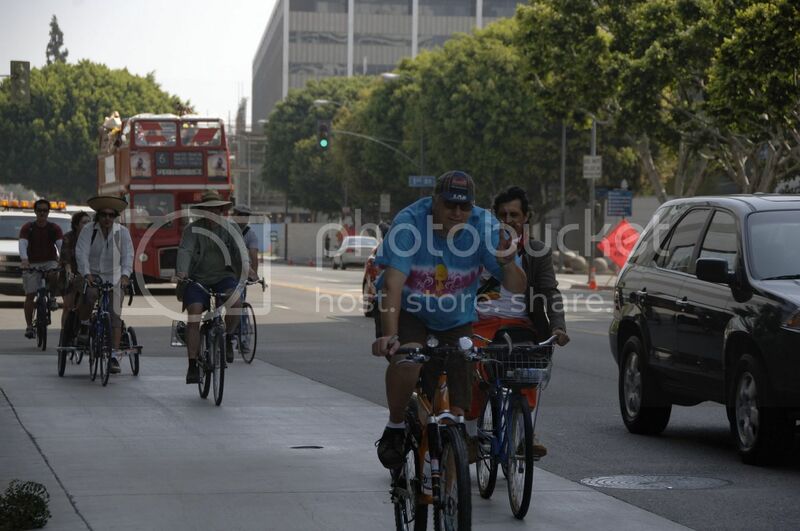 Bicyclists are invited to turn the screening into “bike-in” theater. This remarkable evening of puppetry is organized by Frank Langley – he of Club Puppet and Puppet (After Dark) fame, and features Glank, among other stars of the local and thriving Los Angeles puppeteering scene. More information to be announced soon. Where Do Our Ag Bins Come From? Farmlab's ag bins come to us thanks to the Ventura-based Fillmore-Piru Citrus Association (FPCA). The wooden crates are part of a no-longer-used packing system that once utilized some 3,000 bins. Farmlab team members became familiar with the bins during the Not A Cornfieldproject. 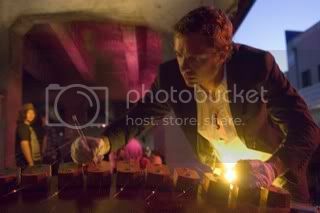 On Saturday, June 16, 2007, the Farmlab Team -- along with many new and longtime friends -- delivered 25 ag bins filled with vegetables and flowers to Skid Row, in downtown Los Angeles. Ag bins -- short for "agricultural bins" -- are wooden cartons; they've been a part of Farmlab's materials pallette since the Not A Cornfield project. For basic information about the purpose of the project, list of participating agencies, and a map of the delivery route, please click here. Below are newly posted photos from the day. See the bottom of the page for captions. 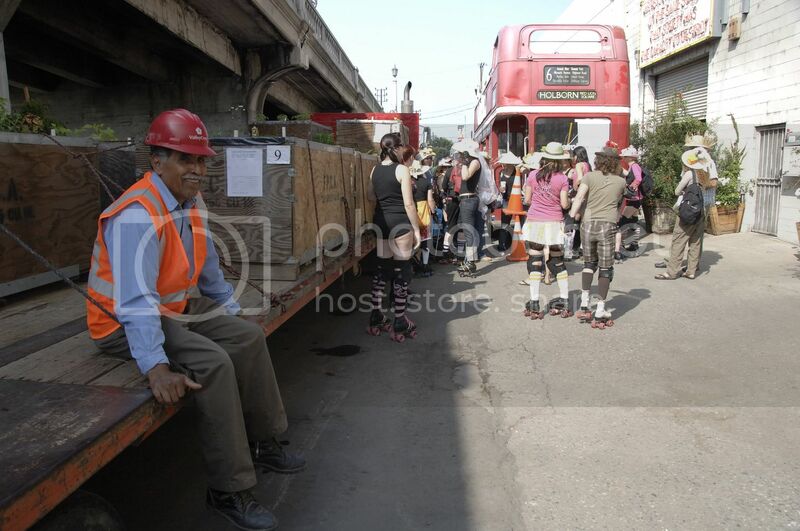 Farmlab Artist-in-Residence Gerardo Vaquero Rosas sits on a flatbed truck otherwise loaded with ag bins, as Derby Dolls and other bus riders prepare to board the double-decker bound for San Julian Street. Local bicyclists from Midnight Ridazz, along with deejays from killradio.org, peddle along Alameda, en route from Farmlab to Skid Row. The cyclists and deejays, along with area musicians, skaters from the L.A. Derby Dolls, a representative from Urban Farming, a newspaper writer, and various other good folks, participated in bin delivery. The weekend prior to the ag bin delivery, the wooden cartons stood, freshly watered, Under Spring, outside of the Farmlab facilities. A new friend shows off seeds -- part of the week's before planting. An evening of live movement demonstrations, video footage, performance and conversation of, on and around the topics of appropriation, inspiration, transformation, and stealing. And, of course, refreshments will be served. Salon = a gathering of people under the roof of an inspiring hostess or host, partly to amuse one another and partly to refine their taste and increase their knowledge through conversation and performance. New York-based choreographer MELINDA RING regularly collaborates with visual artists creating work for video, installation projects, and theater as well. HUH? (2007), was commissioned by The Tang Teaching Museum at Skidmore College, and was made for Martin Kersels’ sculpture RICKETY. BEAUPORT CYCLE(2004) was made specifically for his installation SLEEPER’S DREAM at MASS MoCA. 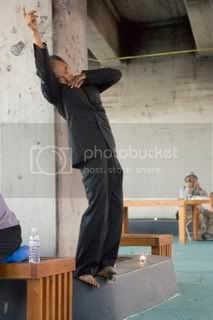 She choreographed a gestural language for DEFINITION (2005), Tirtza Even and Brian Karl’s multimedia installation, which showed at the Skirball Cultural Center (L.A.), The Jewish Museum (N.Y.), and The Contemporary Jewish Museum (S.F.). Ring has appeared in many of Paul McCarthy’s video and film projects. She was a 2005 - 2006 Movement Research artist-in-residence. Her work has been supported by Headlands Center for the Arts, the J. Paul Getty Center, Los Angeles Contemporary Exhibitions(LACE), Audrey Skirball-Kenis Theater Projects, The Los Angeles Cultural Affairs Department, The Puffin Foundation, Movement Research, and La Boca Space at the Sunshine Mission for Women. Recently her work has been seen at The Tang Teaching Museum at Skidmore College, Dance Theater Workshop, Joyce Soho, Movement Research at the Judson Church, Beyond Baroque, and the University of Colorado Boulder. Join Andy Lipkis, founder of Tree People, for a discussion about all things urban and arboreal. Come join Adolfo V. Nodal as he discusses ideas and proposals for cultural planning for Los Angeles during the past few decades, and about where we are heading with this new "Mayor for the Arts" and changes in the city's Cultural Affairs Department management. An extensive question-and-answer period will follow Nodal's remarks. Opening Remarks by Los Angeles City Controller Laura Chick. Adolfo V. Nodal, Farmlab's Executive Director, is also the President of the City of Los Angeles Cultural Affairs Commision. Nodal was appointed by Mayor Antonio Villaraigosa to lead this commision into a new era of activism for the City's cultual community. This appointment is historic in that no commision has ever been headed by a previous General Manager of the same department. Nodal served as General Manager of DCA from 1988-2001. During his tenure, he created the City's first comprehensive arts master plan and oversaw the delivery of millions of new dollars for the arts in our City. Nodal is also the past: Executive Director of The Contemporary Arts Center, New Orleans; Vice President for Management, The MacArthur Park Foundation; Director of Exhibitions, The Exhibition Center, Otis Parsons School of Design; and Executive Director, The Washington Project for the Arts. "Prior to becoming Controller, Laura Chick served as Councilmember, Third District, in the west San Fernando Valley, from 1993-2001. Chick served as the first woman to ever chair the City Council’s Public Safety Committee."